Saturday, November 11, is Veterans Day. You can show your appreciation for our Nation’s veterans by volunteering. Use the Volunteer Service Locator to find opportunities close to you. Contact the VA Voluntary Service to Volunteer or Donate. Volunteer at a VA Medical Center. Students can gain experience and training with the Student Volunteer Program. For more information, visit http://www.va.gov/opa/vetsday/. The American Red Cross also has volunteer opportunities for those that want to support military families. Hoover Building, Garfield County Fairgrounds, 305 E Oxford Ave. NOTE: The EARC primary repeater is in the process of being relocated and is currently NOT on the air so we will be using the 147.375 repeater owned by N5LWT. HOURLY DRAWINGS from 9:00 to 1:00. Drawing for unclaimed prizes at 2:00. GRAND PRIZE DRAWING at 2:00. Reserved tables will be held until 8 a.m., then rented in order of request. All table renters must have an admission wristband. Beans and cornbread and/or hot dogs with relishes, condiments and beverages. *Of course, if you insist on giving us a donation…well, okay. PLEASE DO NOT SIT ON TABLES! The Enid Amateur Radio Club will be doing Community Service with The Enid Welcome Table at Central Christian Church located at 1111 West Broadway, Enid. Enid Welcome Table is a community meal on Sunday evenings for anyone wanting food and company. Every Sunday a local community organization will prepare a meal in the Central Christian Church Kitchen. The Volunteer Organization will arrive at 3pm to prepare the meal and the meal will be served at 4:30 until everyone is served. Please come join the EARC as we have a conversation with our community. All are welcome to join Jamboree on the Air at Camp John Nickels! I will be at SW 119 and County Line Road at Camp john Nickels, that is the south west side of OKC. Doug Cook, KX5DC, WA6LBU and I N5YZA we be there Friday afternoon and all day Saturday. All are welcome to come. We will be using the call WB5BSA, the troop club call for Troop 850 in Guthrie. 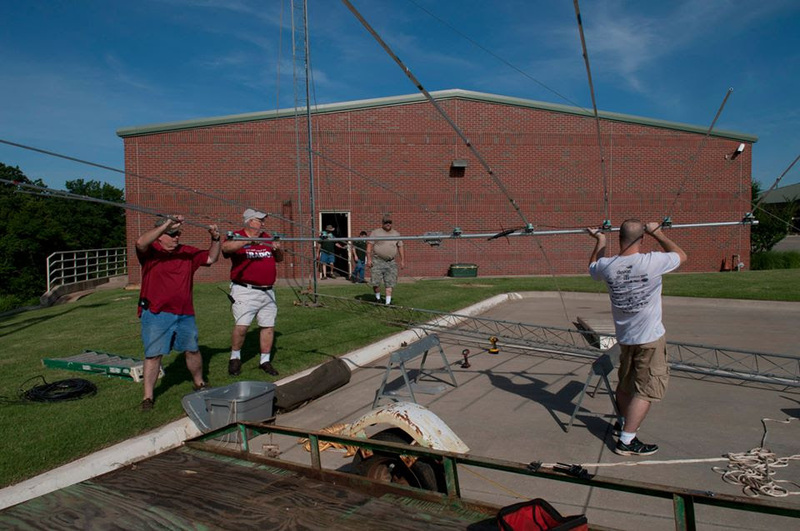 We will be operating on 40 meters and 20 meters depending on band conditions, 7.190 and 14.290, or were ever there is a troop to talk to. We hope to see you there or on the air. All are welcome to join in the Largest Scouting Event in the World - right here in Edmond! Over 1.3 million youth participating with over 11,000 stations operated by 20,000 amateur radio operators from 150 countries worldwide! Everyone is welcome to visit and see Amateur Radio as well as operate a radio. Licensed operators are also requested to visit and help. I will be at the location on Friday the 20th at 9 pm to set up the antennas and unload equipment into the building. I will then return at 7 am on the 21st to get everything up and running. The event will open to the youth at 9 am and run until the last group leaves which has been at 5 pm the past two years. There will be 4 stations set up. Experimental station is for hams to bring any project they would like to work on or test whether it be radio, antenna, etc. This allows for club members to visit and help each other on various projects and invite the youth to get more hands on should they want to help. If club member would like to assist the youth in operating the radios at the stations as they make contacts, that would be greatly appreciated. Radar Scope Fans... You don't want to miss this! RadarScope being one of their products. beginning at 1900 (7 PM). Come early for dinner on your own, we'll be near the back. 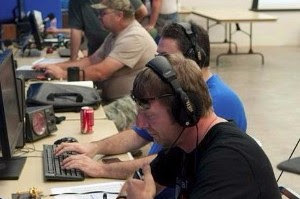 The Citrus Belt Amateur Radio Club of San Bernardino, California, is once again hosting (probably one of the most fun special event activities) the 18th annual 'Route 66 On The Air' special event between September 9-17th. The purpose of this event is to offer amateur radio operators a fun way to "Relive the Ride" of their own memories of Route 66, and to celebrate the highway's 91st anniversary. The U.S. Highway 66 established in 1926, was the first major improved highway to link the west coast with the nations heartland. Through stories, songs, and TV shows, the highway came to symbolize the spirit of the freedom of the open road, inspiring many to see America. along Route 66 during the special event period are encouraged to take part in "Route 66 On The Air", by using the designation "mobile 66" for SSB or "/m66" for CW after their callsigns. All other amateur radio operators are welcome to contact these mobile operators. event from their local VHF/UHF repeaters. Check the ARRL repeater guide for possible repeater frequencies, if you're in the local area. Thanks to Southgate for this information. The PCARC welcomes anyone who would like to attend and participate. We are located in McAlester Oklahoma, in the S.E. part of the state. The club is associated with Emergency Services, does weather watching stuff, Field Day stuff, and occasionally something worthwhile. We do License testing (honestly) monthly with a little notice. We are presently holding meetings in McAlester at 1210 N. West St. just up the road from the maximum security Oklahoma state prison. Thanks to Paul - W5LZ for this note. Who will be at #hamholiday this weekend? Winlink (Radio Message Service) for the next ELMER Class! Winlink is a world-wide system used by hams to transfer e-mail via radio and is heavily relied upon by hams at sea (maritime mobile) and by amateur radio emergency communications. It is also used by MARS and Homeland Security. At Field Day Brian Teters sent messages to the City of Edmond Emergency Operations using Winlink! Winlink uses standardized forms as well as the NTFS formatted messages. Please join us Thursday July 20 at 6:30 PM at the club station, 28 E. Main, Edmond, room 219 for a presentation on the Winlink software by Brian Teters AE5MT. Brian will explain the Winlink network and actually send a Winlink message. We hope to see everyone there! 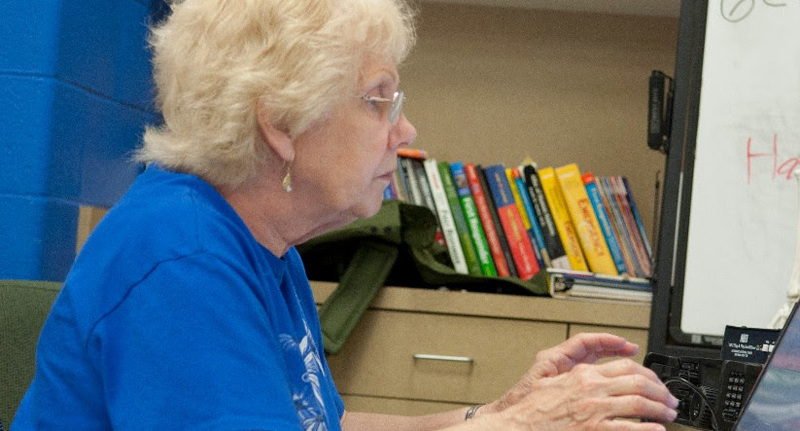 In this photo we see Sharon preparing to send a Winlink e-mail to earn bonus Field Day points.